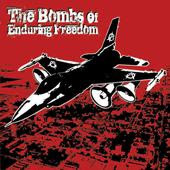 Deep in the suburbs of the UK's drug-death capital, "THE BOMBS OF ENDURING FREEDOM" were born in the council-flat of mass destruction, fathered by prolific underground musician J.F. (Blacksmoke, Ewigkeit, The Meads of Asphodel etc etc...). The explosive devices produced by this attack unit are distorted Break Beats meets Death Metal guitars in a world of Trip-Hop, Drum'n'Bass and World Music reporting on the news and culture of today's 24 hour news worldview. Speaker-destroying beats and sub-bass that could defeat the Atlantic Fleet, soldered to the rhythms of the (sub) urban sprawl, topped with death rock riffs whilst some random sampled unfortunate declares 'The End Is Nigh' - and all with a D.I.Y punk ethic. In a time where virtually all music and art in the media are as revolutionary as a Che Guevara t-shirt, "The Bombs.." are determined to escape the confines of pre-determined sub-genres and paint-by-numbers "band" image in order to write some music that expresses their true sense of being "pissed off" at the modern world in the age of "global terror". It is best to think of THE BOMBS OF ENDURING FREEDOM as Jeremy Paxman and the BBC News 24 team being eaten for dinner by The Prodigy, Ministry and Meat Beat Manifesto.